On a sunny day for football in Saltcoats the home side came away the victors in this second round of matches in the William Tracey Challenge Cup. League leaders Tass just can’t kick that winning habit but were pushed all the way by a Colts side who had Thistle pegged back for long spells of the match. Neither goalkeeper was tested in the game’s opening exchanges, as both sides tried to get the ball down in midfield and play it around on a difficult surface. Unfortunately for Largs, keeper Jonathan Irwin’s first glove on the ball was to pick the ball out of his own net as Tass took the lead on 7 minutes. From a corner down the left Adam Walker’s delivery found Kieran Champion free in the box to nod home from close range. The hosts went on to enjoy a spell of early pressure, with the swirling wind quite literally in their sails. Champion’s runs down the right were causing early problems for the visitors and Kieran Bramwell was seeing a lot of the ball in midfield as Tass sought to consolidate their advantage. After weathering the initial pressure the Largs defence began to push out and gain a foothold in the game. Lewis Dalglish was making some dangerous runs and a nice passing exchange with Glen McTaggart almost found the visitors’ danger man through on goal. And from a neat passage of play Largs were back in the game with an equalising goal on 25 minutes. Moving the ball around the Tass right flank Dylan Smith laid the ball on a plate for Adam Brown rushing into the box. He still had a lot to do but finished with a composed chip into the net giving home keeper Scott Struthers no chance. Shortly later Brown was through on goal again, but this time just couldn’t get the shot away. 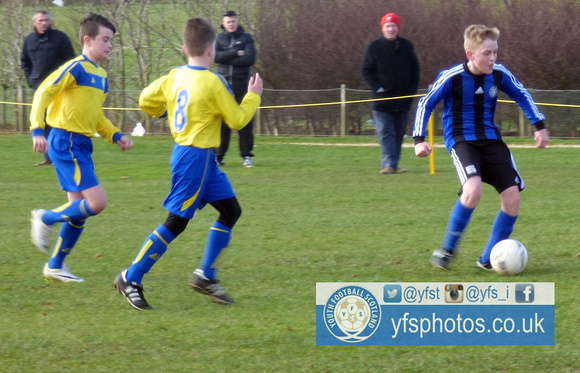 Largs continued to look dangerous, especially through the middle with McTaggart’s tricky footwork and running. After some tidy possession football Jamie Coupar’s 1-2 with Kieran MacNeil put the midfielder through on goal but his shot was well handled by Struthers to keep the sides level at half time. The second half continued in the same fashion as Largs continued to enjoy possession and territory. Smith and Robbie Coupar were beginning to control the midfield, with Smith denied a goal by a fine save from Struthers. Meanwhile Tass sought to press the visitors’ passing game and get influential midfielder Bramwell on the ball. Finally the league leaders got themselves up the pitch and were rewarded with a fine goal to retake the lead. Declan Ferguson ran onto a loose ball down the left, feeding the ball into the path of Robbie Henry in the box. Henry’s instinctive striker’s finish past Irwin got the home side’s noses back in front on 45 minutes. Largs went on the attack in search of an equaliser and were almost back in the game when Jamie Coupar put McTaggart through. Just before he could pull the trigger though he was blocked by the alertness of Struthers in the home goal. Most of the game was still being played in the Tass half but the hosts soon burst up the pitch and claimed a decisive third goal on 60 minutes. The ball found its way into Bramwell down the left hand side of the Largs box, and the midfielder ran on to dispatch past Irwin to give Tass the two goal cushion. It was another fine composed striker’s finish in this cup match, and finishing had proved to be the difference between two evenly matched sides. Largs will be frustrated at not turning their good spells into goals but refused to give up. Another fine run and shot by Smith was saved by Struthers, as the clock ticked down to a memorable cup victory for the league leaders. 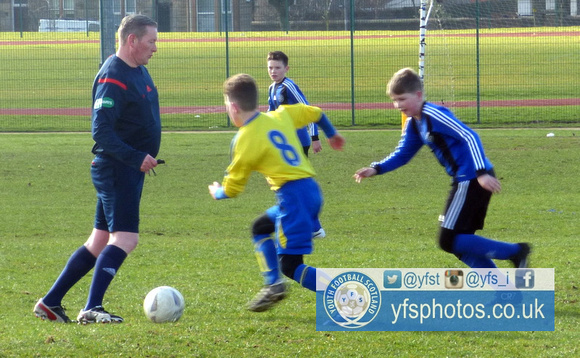 Tass push on for the title now as silverware beckons on all fronts and for Largs it’s back to league business, travelling to Kilmarnock Portland in the next round of fixtures in the Central Ayrshire Youth Football League. Kieran Bramwell. Kept Tass going in middle of the park. Scored the game's decisive goal. Dylan Smith. Got his team forward to control long periods of the game in midfield. Bramwell's decisive goal which put the game's result beyond doubt. Brown's fine finish to cancel out Tass's early lead.